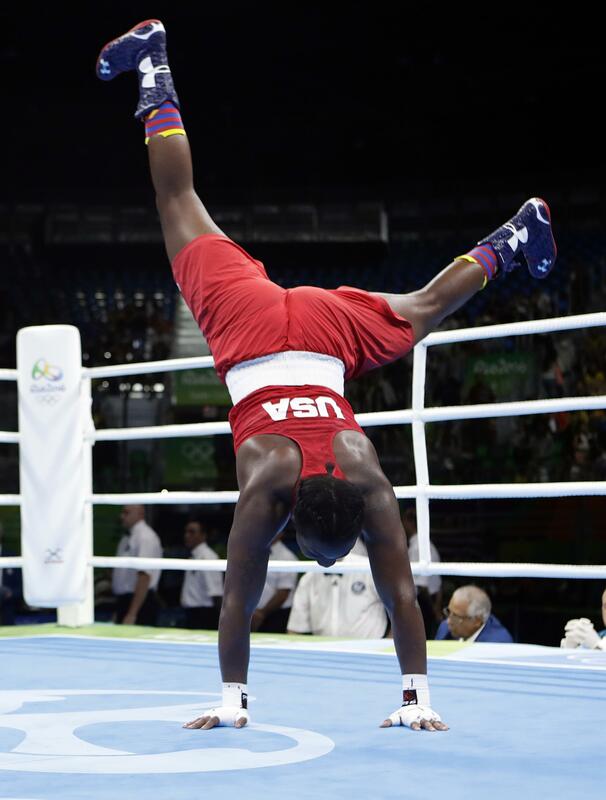 RIO DE JANEIRO – Claressa Shields had Olympic gold around her neck and a secret keepsake in her warmup jacket pocket. She reached in her pocket, pulled out her first gold from London and slipped the medal over her head. Two Olympics, two gold medals. She beamed as she held the medals in her hands for the fans to see – a sparkling reminder that she stood atop the medal stand not only as the best in the world in her class, but as the only American two-time boxing gold medalist. Shields had all the answers as she breezed through three unanimous decision victories in the tournament. The 21-year-old Flint, Michigan, native thumped Dutch fighter Nouchka Fontijn in convincing fashion to wrap up back-to-back middleweight gold. With the title a formality, she gestured toward a passive Fontijn in the fourth round as if to say, “Come fight!” Fontijn offered no resistance and the round served as little more than a coronation for the American face of women’s boxing. Shields ran her Olympics record to 6-0, and she hasn’t lost a fight since London, winning two world championships and a Pan-American Games title over the last four years. Shields, who beat Fontijn at the world championships in May, shook and shimmied before she took her triumphant step on the medal stand. She sang along to the national anthem, then raised both gold medals for all at Riocentro Pavilion 6 to see. Shields hatched the two medal celebration last month as a sign of perceived disrespect as much a dual celebration. “I felt left out. I felt left out because I was like, wow, I’m the first woman to ever win an Olympic gold medal and I didn’t really get any recognition for it,” she said. Shields had the American boxing spotlight to herself on Sunday, adding the Val Barker trophy as the best boxer in the tournament to her medal tally. She was joined by Uzbek light flyweight Hasanboy Dusmatov, who won the men’s Val Barker one week after completing his impressive run to gold. Shields is the sixth American to win a Val Barker Trophy, but the first since Roy Jones Jr. at the 1988 Seoul Games. Will she fight for a third gold? “I don’t know what I’m going to do. It depends on my opportunities,” she said. She joined Britain’s Nicola Adams as the only women to win gold in the London and Rio Games. Shields kicked off the first of four medal bouts on the final day of the 273-bout tournament that quickly turned into doubles action. Shields flashed her two golds. Uzbekistan won two golds. And Sunday capped double gold for the first couple of the Olympic boxing tournament. French fighter Tony Yoka joined fiancee Estelle Mossely as gold medal winners, defeating Britain’s Joe Joyce by split decision in a super heavyweight bout. Mossely won lightweight gold on her 24th birthday on Friday. She sat in the stands, cupped her hands to her face and shouted encouragement toward the 6-foot-5, 201-pound Yoka. Mossely left her seat at the end of the third round and rushed toward the concourse exit before pausing on the steps to hear the decision announced to the crowd. Mossely sprinted toward her man and made a golden leap into Yoka’s massive arms, just as she did after her victory. Only this time, it was Yoka in the boxing vest and trunks and off to the medal stand for a matching gold of his own. The couple has yet to set a date – wanting to focus on performing against the backdrop of Olympic rings before deciding on wedding rings. Uzbek boxer Shakhobidin Zoirov defeated Misah Aloian of Russia by unanimous decision to win flyweight gold. The 23-year-old Zoirov was hoisted on the shoulders of one of his corner men and paraded around the ring in a victory celebration. He dropped the first round to Aloian before he rebounded to sweep the scorecards over the final two rounds. Fazliddin Gaibnazarov defeated Lorenzo Sotomayor of Azerbaijan in the light welterweight final to become the third boxer from Uzbekistan to win gold in the games. Uzbekistan had just one gold ever in the Olympics. Gaibnazarov’s split decision victory made it gold in two straight bouts for Uzbekistan following Zoirov’s victory. Uzbekistan was the stunning winner in the boxing medal count with seven. Cuba and France won six and Kazakhstan and Russia had five.